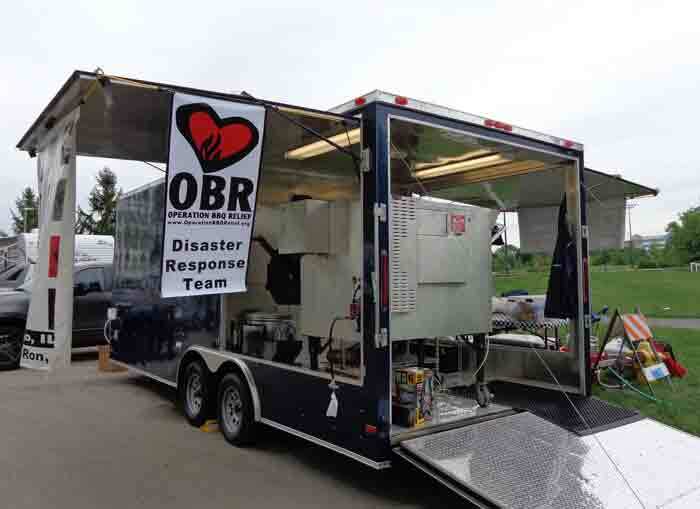 When I went to a big barbecue competition last summer here in Illinois, I was delighted to see that one of the big BBQ rigs at the event was decked out with an OBR banner. OBR stands for Operation Barbecue Relief, and I had only a few weeks before the event learned of this wonderful volunteer organization. The big competitors in the top BBQ competitions have impressively large rigs that can cook a lot of food. However, not all the food they’re cooking is for competitions. When disaster strikes–forest fires, earthquakes, hurricanes, whatever — anywhere in the United States, many of these competitors jump into the trucks that haul their BBQ rigs and head to the trouble spot, ready to feed all those affected by the disaster, both victims and emergency personnel. That’s the sort of thing that makes me get teary-eyed — people seeing a problem and just going and doing what they can to help. It’s hard for me to eat barbecue now without thinking of those folks who are willing to take it where it’s needed most.